Poma Áurea is the first brut nature cider developed by Trabanco and under the Protected Designation of Origin (PDO) "Cider from Asturias". 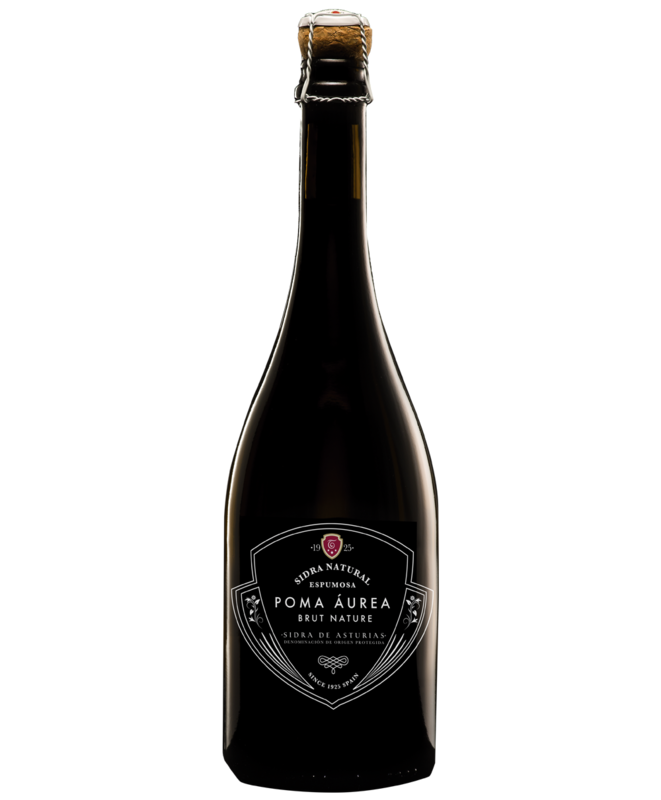 Poma Áurea is a totally natural cider, a brut nature in which both carbon dioxide and sugar are endogenous, i.e. the result of the fermentation process itself. Trabanco´s new brut nature is the result of a careful ion of the raw material. For its elaboration, only two traditional Asturian varieties are used, Regona and Raxao, which ferment at a low temperature for several months in traditional chestnut wood barrels. Once this first phase has been completed, a second, controlled, low-temperature fermentation takes place in a counter-pressure tank. The result: an elegant and harmonious cider brut nature, which shows all its expression as an ideal accompaniment to appetizers (cheeses, pâtés ...) and menus based on rice, seafood or fish. A first fermentation is carried out in chestnut barrels to obtain the natural cider. Afterwards, a second pressure tank fermentation begins according to the Granvás method, which lasts a minimum of 4 months, resulting in endogenous carbon dioxide. Yellow, golden, bright with abundant and persistent bubble of fine size and homogeneous and continuous detachment. From the start, it reminds us of aromas of orchard flowers and wild camomile, ending in figs and raisins. In the mouth it runs smoothly, leaving a very harmonious and quite dry memory, with notes of wood.